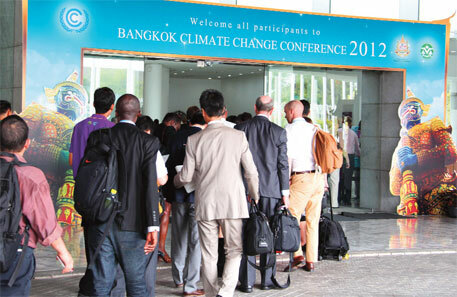 A WEEK of informal negotiations on climate change concluded in Bangkok on September 5. The 190-plus countries that participated in the meeting did not achieve sufficient progress on the issues that have a bearing on a global agreement on climate change. The issues, including the future of Kyoto Protocol that ends in December and a work plan for the future deal, will now be discussed in the Conference of Parties (CoP) meeting to be held in Doha, Qatar, later this year. Negotiations in Bangkok happened under three tracks: ad-hoc working group on Kyoto Protocol (AWG-KP), ad-hoc working group on long-term cooperative action (AWG-LCA) and ad-hoc working group on Durban Platform (ADP). Under AWG-KP, old issues remained. The Protocol, a hard won success for developing countries, is the only legally binding treaty that mandates developed countries to cut their emissions. Now that the treaty is about to expire, its second commitment phase needs to be agreed upon. However, the countries meeting in Bangkok could not arrive at a consensus on the period for its second phase, or the commitments on emission reduction that developed countries are supposed to make under it. The LCA track, which was created to ensure that countries not covered by the Protocol remained accountable in reducing emissions, is also supposed to end this year as per the decision taken at the Durban CoP held in 2011 (see ‘Time out’, Down To Earth, December 16-31, 2011). While developed countries pushed for its closure this year, several developing countries said several key issues remain unresolved in the LCA track. It cannot be closed till the issues were resolved, they said. Reiterating that there is no clarity on how technology will be transferred or what will be the mechanism of financial transfers from developed to developing countries under the LCA track, a delegate from the Philippines said it was pointless to discuss anything till such issues were resolved. “Developed countries are refusing to show any progress on the means of implementation of the track. This is crucial to move forward to any other platform (ADP),” he said. The third track, ADP, which was formed in Durban last year, was to discuss the “what and the how” of a work plan for moving towards a post-2020 agreement on climate change. There were some discussions on ambition gap under this track. The 2010 Emissions Gap Report by the United Nations Environment Programme (UNEP) had identified a gap in ambition between what parties—developed and developing—had pledged for 2020 and that which would be sufficient to limit global warming to 2°C. To bridge this gap, many options were brought to the fore during the ADP session in Bangkok. Many developing countries said the emission reduction targets of the developed countries should be at least 25-40 per cent below the 1990 levels as suggested by IPCC. Spearheaded by the US, the developed countries also pushed for diversionary tactics such as measures to reduce emissions by institutions and initiatives outside UNFCCC. These included reducing emissions through the control of hydrofluorocarbons, methane and black carbon. They also pointed to a participation gap, calling for more voluntary pledges from developing countries. “It is the size of the pledges, not the number of governments, that will make the difference. We are not facing a participation gap—it is an ambition gap,” said Niklas Hohne, director of Energy and Climate Policy at Ecofys in the Netherlands. Failure of the week long informal negotiations on climate change in Bangkok on September 5 is not a mystery. The intension of the developed countries is loud and clear, They would like to continue with the superiority in trade and weapons that they have achieved by impoverishment of resources of the developing and least developed countries by waging and winning wars, and doling out aid and loans. In order to sustain their superiority, they would advise others to adopt austerity measures while they themselves would remain wasteful. This is what they did at Bangkok when they pushed for diversionary tactics such as measures to reduce emissions by institutions and initiatives outside UNFCCC. These measures included reducing emissions through the control of hydrofluorocarbons, methane and black carbon. They did not make any mention of the lethal weapons or the carpet bombing or drone attacks, because if they did their superiority would be jeopardized. I have already explained in no ambiguous terms that the production of CFCs, GHGs including excessive amount of water vapour is the result of intensifying the anthropogenic activity initiated and cashed by the developed countries. The harm that such activities have done to the environment of the earth is irreversible. Yet they would like to remain in command and for that matter they must maintain their growth rate. Sustainability principles on the other hand demand that excesses must be avoided and wastes must be minimized. To achieve this end the race for superiority must be given a grinding halt. It is easier said than done because no one would like to go back to stone age. But with so much of sophisticated arms around produced only to achieve a higher overkill capacity, are we not heading towards the stone wall, if not stone age. Sustainability principles clearly define arms build up as non-sustainable. The path delineated by these principles suggests peace to be the guiding principles of sustainability. But the superior nations maintain that they have engaged their enemies in war to bring in peace. So Sir, the vicious circle of social pollution is set into perpetual motion. When we prepare for the next meeting at Doha, there should be only one agenda and that should be to devise a strategy for sustainable growth. This will limit the growth processes to sustainable living and would delimit arms production and perhaps that may be one way to live in harmony and peace.